When did your congregation have a great “ah-ha” moment? In our changing world, how is God leading you to do ministry a new way? Come and see a gifted minister and author talk about life-changing work in the church. If it’s time to get excited again about meaningful ministry in your congregation, you want to spend a day with Ruth Fletcher. Ruth is a faithful, effective Disciples Regional Minister in Montana. 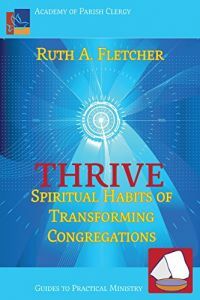 She’s written the book “Thrive: Spiritual Habits of Transforming Congregations,” and she’s going to visit our Region on Saturday, February 18, 10 am to 3 pm at Carlock Christian Church. You are invited! She’ll talk about the transformation of your congregation and tell stories about churches that have been changed by the strong leading of the Spirit. Her book is clear and accessible. It has 12 appendices that provide practical tools for this adventure of transformation. Ruth Fletcher’s book, “Thrive,” is available at Amazon. This article offers a little more info about the Feb. 18 event.